Shotgun cartridges haven’t always been made of plastic, and not all of them are now. I have no idea of the relative merits of plastic cartridges versus cartridges made of other materials, but this area certainly seems worth thinking about. I look forward to being told that plastic cartridges are ‘traditional’. Here are a few examples of adverts for cartridges showing that plastic and fibre cartridges are currently availalbe – here, here, here. Not only are the cartridge cases made of plastic but there is also an internal plastic piece to separate the shot from the charge which ends up being fired from the shotgun. You are correct about these plastic wads but fibre wads are also available. As someone who shoots I am interested in what the gun trade is doing about single use plastics, plastic cartridges, plastic wads, and lead shot. Not enough in my opinion! I remember using cardboard cartridges back when I were a youngster./ Nothing wrong with them so long as they did not get wet, when they could swell and either not fit in the breech, or get stuck. Sometimes my wildfowling uncle would give the big ones ( eight bore) an extra coat of varnish. However, in this adverts the word 'fibre' does not refer to the cartridge case. Rather, it describes the wadding inside the case which separates the shot from its charge of powder. In the days of paper cartridges all wads were fibre, biodegradable and unobtrusive. Then one piece plastic wads were introduced, initially in clay pigeon shooting. They produced superior ballistics and came to dominate especially when most if not all cases became routinely plastic, Then, I recall many livestock farmers being unhappy with the plastic wad which is larger than its fibre predecessor, effectively a plastic cup inside the case, as there were incidents of injury and even mortality amongst livestock that picked up the plastic ad ingested it. So in the case of a modern shotgun cartridge, when it goes bang two pieces of plastic end up being dumped in the countryside. I was always brought up to pick up my cartridge cases ( for re-loading ,and to prevent leaving evidence in the event of a little 'extra-permission excursions), but never went looking for the wad ,though I did ,and do pick them up if I see them. Memories similar to Norman's, Dad always collected the empty cartridges up, they were litter and genuine folk didn't leave litter. So, the tradition in this instance has sadly 'modernised' to becoming a risk to the countryside. Perhaps the cartridge companies could start some recycling scheme where the poor beaters were paid to return #singleuseplastic to the makers who could recycle? Now there's a media opportunity for shooting organisations and representatives? They could also encourage the public to get involved .... with cleaning up their mess? Wonder if we'll hear the same waffle which has accompanied the lead shot argument rolled out again in terms of changing practice etc.? Doing my bit of litter picking on local, quite back roads, I’m always surprised at the amount of these things I pick up, usually from field access points. Strange that since I thought that one shouldn’t shoot from a roadside. But yes, they are as much of a menace as the lead shot they contain. Knowing nothing of shotguns and cartridges I found this blog, the adverts and Norman McCanch's comments fascinating. Interesting to see the availability of non-lead shot; bismuth, steel and copper coated. Should be easy to move to non-lead but difficult to work out cost per unit. I once surveyed a farm with a clay shoot. 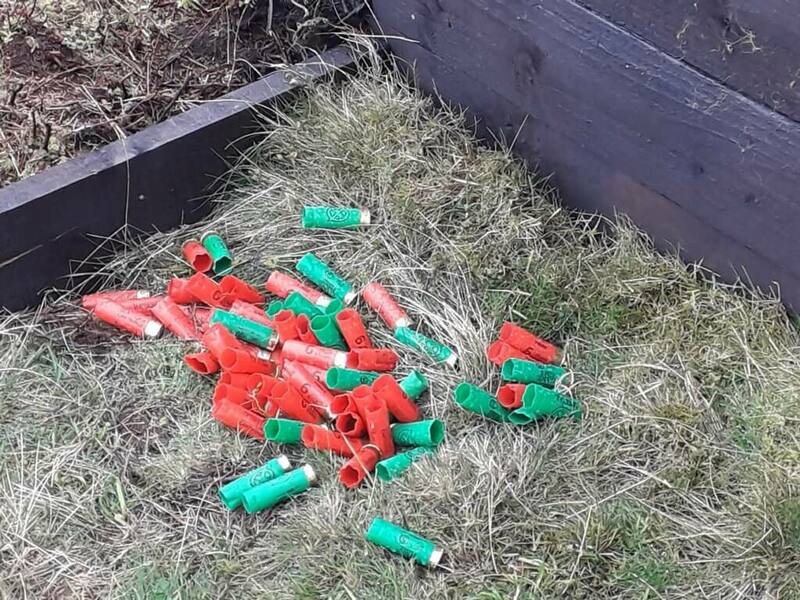 All cartridge cases were cleared up but the shattered clays littered the field. I assumed these were made of plastic, looking at the debris, but got taken severely to task on another blog for the suggestion. Clays are clay apparently. I imagine there was a deal of residual lead shot scattered around as well, perhaps I'm wrong about that as well. Anyone educate me? I don't believe it is true to suggest 'clays are clay'. According to this web-site the majority are a blend of pitch and milled limestone https://www.sportsrec.com/composition-clay-pigeons-8283200.html. I don't know what the environmental impact of fragments of this material littering the countryside is but you are certainly correct that there will be a lot of residual lead shot scattered around the area of the shoot. Cartridge cases are either plastic or paper , with a general preference for plastic as they are less susceptible to damp and are cheaper . The wads will be either plastic , fibre or wool and I don’t know anyone who shoots game that uses anything other than fibre wads With the spent cartridges being collected by themselves or the shoot. Malcolm - thank you for the comment, but the comment wasn't unwarranted for the pile of cartridges featured in the photo (left after a day's shooting). But I appreciate your comment, thanks. So what am I picking up then, chewing gum wrappers? I dare say that some shooters are responsible and pick up their spent cartridges and use only cartridges with biodegradable wads (if they are really responsible they will also choose non toxic shot) but not all shooters are responsible either here or abroad. In southern France I have seen large numbers of cartridges and plastic wads littering the ground in areas that are regularly shot over. Actually, shooters have a choice of either plastic or fibre wadding. Ideally, plastic wads would be banned (cartridge cases can be picked up and disposed of, but the wad is fired out with the shot and lost). No one should be shooting plastic wadded cartridges in the wild. If they must be used at all it should be limited to clay ranges. Paper cartridge cases and non-toxic shot is the future...or should be. "Agricycle", and others, are providing a valuable service, in what is still a fledgling industry. very deep pockets, which contrary to belief most shooters do not posess. Currently the most popular material is plastic, but manufacturers are being urged to develop fibre cups to provide the same protection. sometimes things get delayed a little, but should certainly be sorted at seasons end. It is not illegal to discharge a firearm from the highway, as long as the public is not inconvenienced. My understanding is that the law states " it is an offence to discharge a firearm within 50 feet of the Highway", so shooting from the road is an infringement. It is also worth noting that an offence has been committed if the projectiles travel outside the boundary of the shooters permission. That is probably one of the most ignored bits of guidance/legislation in the whole realm of shooting sports!! Found some piles of spent shotgun cartridges in grouse butts near Kildale in the North York Moors several months ago. A while before that I found one or two on grouse butts on Urra moor. Littering is disgraceful no matter who's doing it, and it can't be difficult to clean up your cartridges after a drive. You might be interested to know that I contacted BASC a couple of years ago and asked if they could tell me how long it takes for so called biodegradeable plastic wads to actually biodegrade. Their experts were very helpful and contacted plaswad manufacturers who were unable to advise as to how many years these wads would take to be broken down in the environment. So it seems they could be lying about for a very VERY long time! Where I live I frequently see these plaswads washed up on the edges of pools where ducks are shot. In the wood we manage as volunteers for the wildlife trust, there was, until 2002, a small amount of pheasant shooting. The wood is still littered with cartridges, we constantly find them whilst coppicing.......I think if we spent the number of hours we do coppicing on picking those up we might just about find most of them. Problem is most of the wood is non-intervention so we don't walk through it.......so we don't see them and neither does anyone else. I expect they will still be lingering when we have gone. Thanks Norman, I realised my mistake too late. situation, but with instructions to only fire away from the road, and not at all if traffic is passing. Have you still got any of those 8 bore cases left ?. Thanks Trapit! Sadly the 8 bore was lost in a boating accident (along with uncle Jim) on the Severn estuary 40 years ago. I had some brass cases for a while, but in my impoverished days I sold them for ready cash.